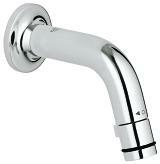 Reduced to the essentials, the Universal Pillar Tap is the stylish and economical solution for guest bathrooms with a single-source supply of cold or pre-heated water. 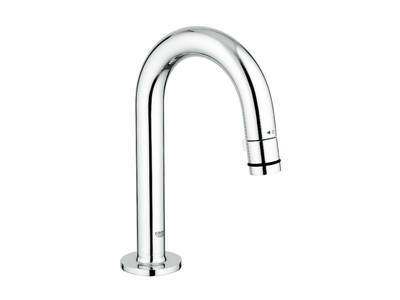 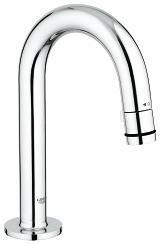 Its slender, understated design and universal appeal complements all Cosmopolitan and Contemporary faucet lines, while the customary faucet lever or handle is replaced with a simple twist of the end of the spout. 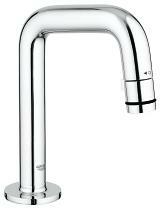 Finished in GROHE StarLight® chrome, the collection offers a choice of four designs to meet the requirements of your installation. 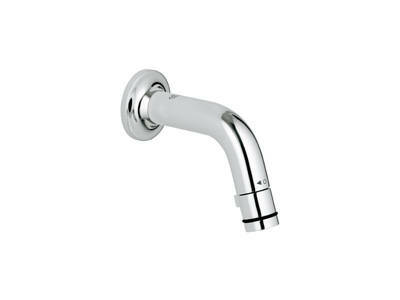 Choose from deck-mounted with either a C-shaped or 7º spout, or wall-mounted with a choice of 105 mm or 185 mm spout projection – to accommodate a range of basin styles.